The best furniture is often the simplest. The spare design makes a big impact, and the furniture offers you the functionality you need by focusing on the quality of the construction rather than a lot of fussy bells and whistles. The Minima Murphy sofa shows just how big an impact a simplistic design can make. The gorgeous bed can help you maximize a small space, and it adds functionality to your home. 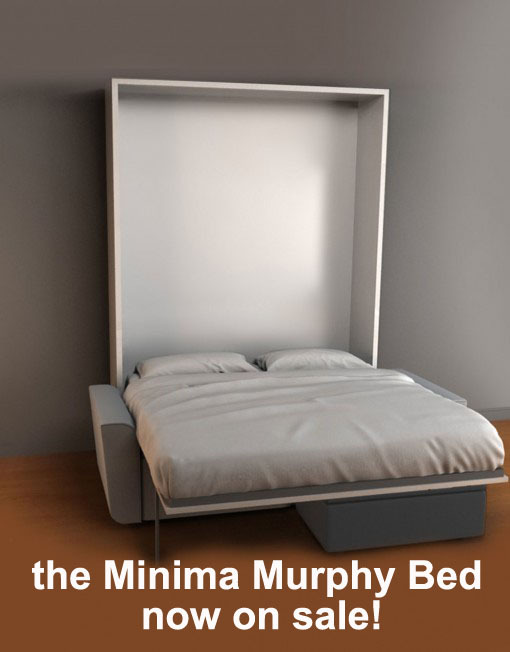 You may already be familiar with the Murphy bed. 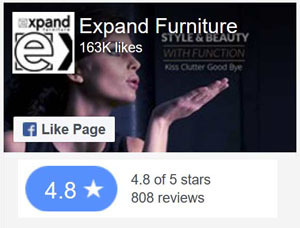 It features a mattress on a hinged platform that is attached to a cabinet attached to the wall. When you are done sleeping, you can lift the mattress platform up and push it against the wall. Instead of having a large bed taking up the majority of space in your bedroom, you have a cabinet leaning against the wall that doesn’t protrude more than a foot. Many people use Murphy beds when they are looking to save space in their homes. For example, a Murphy bed is a great choice for a kid’s room because it frees up the floor space for play during the day. Some want to have a guest room in their home, as well as a home office, but they don’t have room for both. The pull-out sofa used to be the popular solution, but it proved to be cumbersome and uncomfortable. Instead of struggling to pull out a rickety old mattress when guests are in town, you can invest in a Minima Murphy sofa or any number of our convertible wall beds with sofa. During the day, the mattress is tucked neatly away in the cabinet behind the sofa. When you have guests, just pull down the bed, and it rests neatly right over the sofa. You don’t even have to move any cushions. If you live in a small studio apartment, the Minima Murphy sofa can help you use the main room as an entertaining space and a bedroom. The storage ottoman that accompanies the sofa also gives you room to store things like books and throw blankets. With just one piece of furniture, you’ll get maximum use out of the space. Just because the Minima Murphy sofa offers exceptional functionality doesn’t mean that it looks boring and business-like. The wall bed sofa is gorgeous, and it creates a modern, stylish aesthetic for your home. The wall cabinet is finished in a glossy white that looks modern and sophisticated. The finish reflects the light, which makes the room look larger and more airy. The sofa comes with a beautiful, soft grey fabric. Other options include a beige fabric or a tan leather. All of the colors pair well with the white cabinet, and the combination creates a gorgeous look for any room. If you like, you can punch up the aesthetic by adding brightly colored pillows to the couch or a beautiful print to the panel. 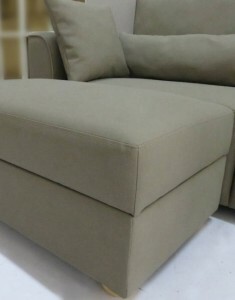 The Minima Murphy sofa is made by expert craftsmen with easy an easy assemble design and quality hardware. Currently it includes the bonus ottoman to make it a mini sectional sofa murphy bed on top of being on a introductory sale price. You can save a full $1,000 to get this beautiful, space-saving bed that will make your home seem larger and look more attractive. 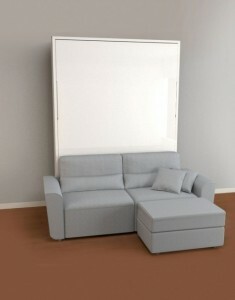 The sale is a special promotional event to encourage pre-orders of this exceptional Murphy sofa bed. We don’t know how long the pricing will last. 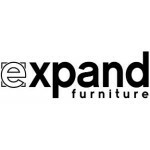 Order your Minima Murphy sofa from Expand Furniture now, or explore our catalog for other space-saving Murphy beds that come with desks, bookshelves and other accessories. 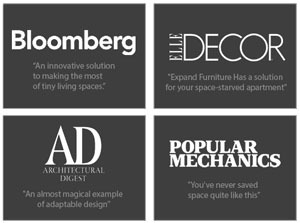 Our extensive catalog also includes other stylish furniture to help you maximize the space in your home, including transforming tables, expanding chairs, modular shelving units, and more. All of our furniture is made to order to ensure the highest level of quality in the finished product. 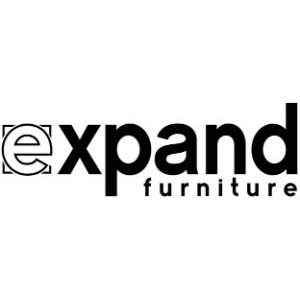 You can enjoy stylish furniture for decades to come when you order from Expand Furniture. Contact us today to find the perfect solutions for your home. Our New Sofa Beds Are “Just Right” …Goldilocks Approved.